This article first appeared in City & Country, The Edge Malaysia Weekly, on June 19, 2017 - June 25, 2017. In a bid to expand its target market, UDA Holdings Bhd is working to shed its image of a developer that only caters for bumiputeras. The group hopes to gain more customers by introducing modern, culturally diverse products. “We are trying our best to portray ourselves as a developer for all,” says group managing director Datuk Ahmad Abu Bakar. Nonetheless, this perception is slowly changing, says Ahmad. “Based on our take-up rates and sales lately, we have noticed that there is a wider range of buyers that are opting for our products. We believe we are gaining the confidence of the public. “Like other developers, we are looking for opportunities to maximise our profit. I believe we are heading towards the direction where our products will fit the needs of the mass market,” he declares. UDA Holdings has a long history in the local property development industry. The Urban Development Authority (UDA) was first established by the government on Nov 12, 1971, to spearhead the nation’s planned urban development. Subsequently, UDA Holdings was formed on July 14, 1999, and listed on the Main Board of the Kuala Lumpur Stock Exchange on Nov 19 the same year. About 50% of UDA Holdings’ shares were acquired by Khazanah Nasional Bhd in 2004. The shares were transferred to the Ministry of Finance in 2008. The group had been placed under the ministry following the dissolution of the Ministry of Entrepreneur and Cooperative Development in 2009. Some of UDA Holdings’ oldest developments — such as Pasar Besar Taman Tun Dr Ismail, Hentian Puduraya, Sinar Kota and Dataran Maybank — are now landmarks. Ahmad maintains that the group has become bolder in terms of its developments in recent years. One of its notable ongoing projects is the Bukit Bintang City Centre (BBCC). The RM8.7 billion regeneration of the 19.4-acre Pudu Jail site in Kuala Lumpur is being undertaken by BBCC Development Sdn Bhd, a joint venture between UDA Holdings (40%), Eco World Development Group Bhd (40%) and the Employees Provident Fund (20%). As at April, UDA Holdings had a land bank of 1,240 acres (of ongoing and upcoming projects) across all states in Peninsular Malaysia, with a total gross development value (GDV) of RM19.9 billion. UDA Holdings posted revenue of RM15.8 million as at April. The group also saw unbilled sales of RM472 million — RM264 million for residential and RM208 million for office and retail developments. This year, the company plans to launch RM713.1 million worth of projects at its ongoing and upcoming developments such as Anggun Residences at Jalan Sultan Ismail and BBCC in Kuala Lumpur, Kampung Morten in Melaka, and Ipoh Waqf Centre in Perak. Meanwhile, UDA Holdings has named Legasi Residensi Kampong Bharu in Kuala Lumpur and Swara at KL South in Cheras as two of its highly anticipated projects for this year. Swara has a GDV of RM183.4 million and is targeted to be launched in the third quarter. 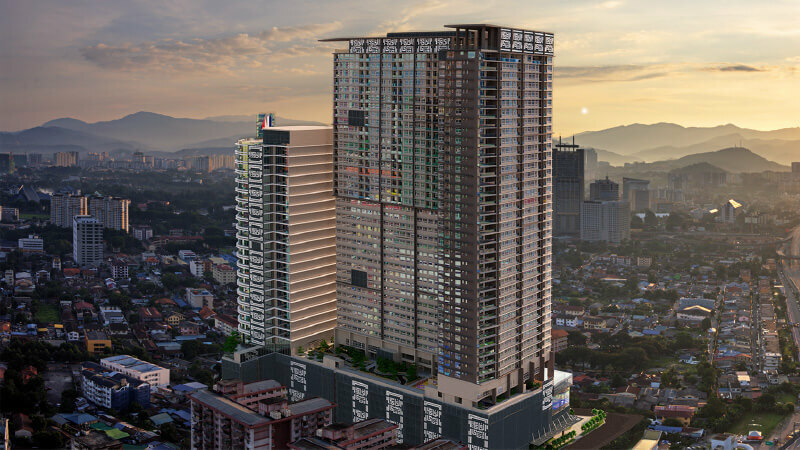 Located on a freehold 5.68-acre parcel in Bandar Tun Hussein Onn, the 34-storey block will offer 341 residential and four retail units. The development will be made up of mostly 3-bedroom units with built-ups of 900 to 1,500 sq ft each, and priced from RM450,000. Set to be completed by the third quarter of 2020, it will have facilities such as swimming pools, a multipurpose hall, cafeteria, gymnasium, amphitheatre and jogging track. “Swara is located near the Bandar Tun Hussein Onn MRT Station (expected to be operational in 2018) and has access to five major highways — the Cheras-Kajang Highway, SILK Highway, Besraya Highway, Middle Ring Road 2 and South Klang Valley Expressway,” says Ahmad. Amenities nearby include an AEON BiG, Citibank, Hong Leong Bank, Sekolah Kebangsaan Bandar Tun Hussein Onn and SMK Bandar Tun Hussein Onn. This RM529 million project is set to become the next commercial hub in Kampung Baru, Kuala Lumpur. Ground work at the 2.85-acre parcel, which was once the location of the village’s Sunday market, is progressing smoothly and is about 20% completed. “We are positioning Legasi Residensi as a new landmark for urbanites to own their dream homes, especially in the middle of the city centre and at competitive prices. Our prices are lower than those offered by other developers, especially in the Golden Triangle area,” says Ahmad. Located in Jalan Raja Muda Musa, the mixed-use development will have 639 residential units spread across two towers as well as 83 offices and 43 retail units. It is expected to be completed by June 2020. The two 43-storey residential towers will offer a range of units, with built-ups of 807 to 1,907 sq ft. The Rumah Wilayah Persekutuan (Rumawip) units are priced at about RM300,000 each, with a 10-year moratorium period. Other units, under the “open category”, have prices ranging from RM1.3 million to RM1.4 million for Type A, and from RM716,200 to RM749,600 for Type B. The office units are priced from RM1.2 million onwards while the retail units start at RM837,000. “For Legasi Residensi, our target market is young executives, first-time homebuyers, young couples and families, and the bumiputera residents in Kampung Baru,” says Ahmad. So far, the response has been good, even though there has not been much publicity about the development since it was launched on Jan 24. “We have sold 165 out of the 206 units of affordable homes under the Rumawip category. We have also successfully sold 45% of the open-category units,” he adds. A variety of facilities will be offered, including a convenience store, swimming pool, café, gymnasium, nursery, surau, library and multipurpose halls. The maintenance fee will be 30 sen psf. Amenities nearby include Universiti Kuala Lumpur, Universiti Teknologi Malaysia, Hospital Kuala Lumpur and Suria KLCC. The project is connected to the Kampung Baru LRT Station, as well as near the Medan Tuanku Monorail station and heritage area, and is easily accessible via the Ampang-Kuala Lumpur Elevated Highway (Akleh). “We are hoping to develop a series of developments based on Legasi Residensi all over Malaysia. We have one called Legasi Bertam in Penang that is in the pipeline,” reveals Ahmad. Located on a 1-acre parcel in Bertam, the project has a GDV of RM3.4 million. With an indicative price of RM45,000 per unit, the 80 units (built-ups: 650 sq ft each) will have a similar design concept as Legasi Residensi. “For the first quarter of next year, we are planning to launch our next project — a redevelopment of Kompleks Niaga Utama in Bangsar into fully furnished serviced apartments,” reveals Ahmad. The project has a GDV of RM277 million and is located in the affluent part of Bangsar. Further details will be revealed soon, he says.